Very sad to get the news today that Canon USA’s Chuck Westfall passed away. A great loss for especially Canon photographers worldwide, who could always turn to Westfall not only for expert advice and guidance, but quite often also for personal help. Back in 2007 when I made the decision to invest in Canon photography equipment, Chuck Westfall was practically the face of Canon’s photography division on the Internet. Everywhere you went, Westfall was around sharing technical advice, either through articles, interviews or comments. Later on when I was disappointed with Canon and decided to put up a blog to voice my criticism comparable to the Fake Steve blog, the only executive that I could use that would be recognizable and speak to photographers worldwide was Chuck Westfall. Had I chosen Canon (USA)’s CEO or any other top level executive, very few people would know who they were, and the Fake Chuck blog would certainly not have had the impact that it did. This says a ton about what Chuck Westfall was to Canon. And I think this reveals one of the important reasons why Microsoft is so successful: They know how to take honest criticism and act on it to improve. And I can say the same thing about some executives at Canon, most notably Chuck Westfall from Canon USA. I’ve criticized Chuck personally in the past, sent some angry emails to him and others at Canon, but to this day Chuck still replies to me when I give feedback and helps me if he can. Everything people say about Chuck’s generosity and knowledge on the Internet is true. And I think it’s because of people like Chuck Westfall at Canon that today we’re seeing Canon making a huge comeback in this industry with products such as the 5D Mark III. 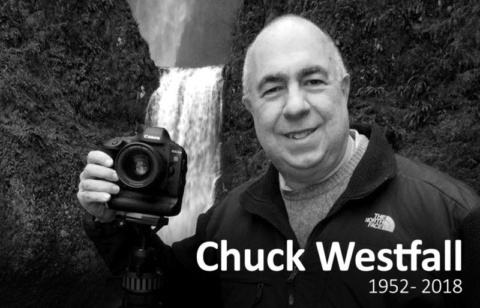 It’s going to be a sad day for Canon photographers worldwide when Chuck Westfall retires from his job at Canon USA. I don’t want to go into any details here, but sometimes his offers for help were not what you would expect from a business executive at a corporation, but more like that of a close friend that you knew. Suffice to say, he went out of his way to help, and you will find more stories like these around the Internet. The only other person that I know that comes close to Westfall in this regard is Helen Oster from Adorama. Thanks again for everything Chuck, I’ll never forget you. This entry was published on Friday, March 16th, 2018 at 7:40 pm by Karel Donk and is filed under Personal Photography. You can use the permanent link to bookmark and/or share it. Sorry to know. He was a great helping mind indeed. May his soul rest in eternal peace.